Growing up before online games were popular, outside of PC games, some of my favorite gaming moments involved playing splitscreen co-op games with my brother. My brother and I really enjoyed playing cooperative beat ’em up games like the Teenage Mutant Ninja Turtles games on the NES and SNES. While there has been somewhat of a resurgence in recent years, the splitscreen co-op genre is not as popular as it once was. Therefore I am intrigued whenever I see new splitscreen co-op games. This is initially why I was interested in Unruly Heroes. Then I saw the game’s visual style and I knew I had to try out the game. Unruly Heroes is a fun blend of platforming and beat ’em up mechanics with stunning visuals which leads to a satisfying adventure to share with your friends and family. We at Geeky Hobbies would like to thank Magic Design Games for the review copy of Unruly Heroes used for this review. Other than receiving a free copy of the game to review, we at Geeky Hobbies received no other compensation for this review. Receiving the review copy for free had no impact on the content of this review or the final score. Unruly Heroes is a re-imagined telling of the famous Chinese novel Journey to the West. In Unruly Heroes you play as a group of four heroes. The world has been held together in harmony by a sacred scroll for ages. When the scroll is torn to pieces, the world in plunged into darkness. Our group of heroes must work together in order to find the pieces of the scroll and fight back against the forces of evil that threaten the world. Unruly Heroes is the type of video game that doesn’t fit perfectly into any one genre. If I had to describe Unruly Heroes I would probably classify it mostly as a combination of a beat ’em up and a platformer with light puzzle solving added in for flavor. The platforming in the game for the most part is pretty basic. You mostly just jump between platforms trying to avoid various traps and pits that will kill the characters. Outside of some of the characters’ special abilities, there is nothing particularly special when it comes to the platforming elements of the game. Characters can jump off walls and there are two characters with a double jump while the other two have more of a gliding jump. If you have ever played a platformer before, you should have a good idea of what to expect from this aspect of the game. While it is not that original, I enjoyed the platforming elements of the game. In general I would say that the platforming is on the easy side. Outside of the occasional cheap death, you shouldn’t really have any issues with the platforming elements in the game. 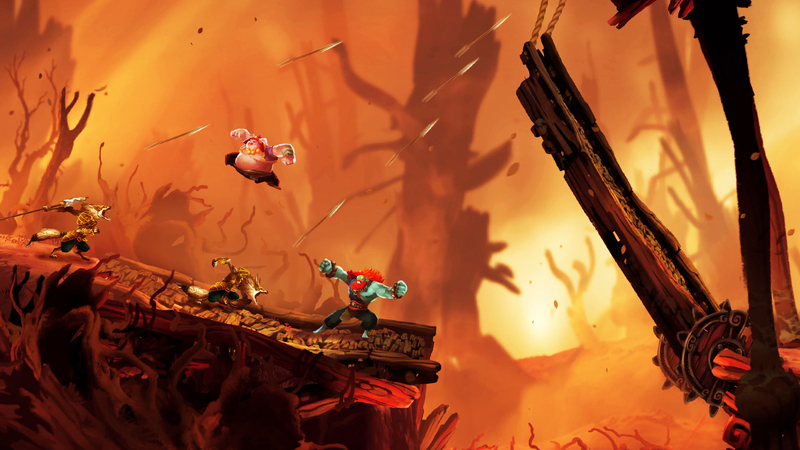 In addition to the platforming mechanics, Unruly Heroes utilizes beat ’em up mechanics. This element of the game actually reminded me quite a bit of classic games from the genre like the original Teenage Mutant Ninja Turtles games. The game gives you a couple different attacks. There is a light, heavy, and ranged attack which you need to mix and match in order to succeed. After you have defeated enough enemies, you unlock a special ability which is unique for each character. While you can employ some strategy in combat by utilizing dodges, the game relies on quite a bit of button mashing. The combat sections of the game are broken up into two different types. While platforming you will run into groups of enemies. These battles are generally pretty easy as button mashing usually works quite well. Most of the levels also end with some sort of boss fight though. These fights are considerably more difficult. These battles mostly focus on figuring out the boss’ attacks and how to successfully dodge them. In between attacks you need to hit the boss’ weak spot to deplete their health. Some of these boss fights aren’t that hard but some can be quite challenging. This is because the boss fights rely pretty heavily on dodging. If you try to just pummel the boss with constant attacks you are going to die quickly as their attacks can deal a lot of damage. There are going to be boss fights that you will have to try several times before you finally succeed. This would normally be kind of frustrating but the game gives you a checkpoint near these boss fights so you don’t lose a lot of progress when you die. Finally in addition to the platforming and beat ’em up mechanics, there is also some light puzzle solving. I want to put emphasis on the word light as the puzzles aren’t particularly challenging. A lot of the puzzles involve using the characters’ different special abilities to open up the path to the next area. The puzzles are mostly used for brief distractions as I can’t really see any of them being challenging enough to really stump anyone. This is kind of expected as you don’t really play a game like Unruly Heroes expecting it to have brain teasing puzzles. Unruly Heroes is an interesting game. I wouldn’t say that the game does anything particularly original as all of the main mechanics have been used by other games in the past. The thing is I don’t think Unruly Heroes was necessarily trying to be highly original. Instead of trying to create unique mechanics, the game is more focused on creating a good game using the mechanics that it has. In this way I think Unruly Heroes succeeds. The combination of platforming, beat ’em up, and light puzzle solving mechanics leads to a fun game. This is made even better if you play the game cooperatively with one or more friends. It might not be the most original game, but I have enjoyed my time playing Unruly Heroes. In addition to being an enjoyable game to play, the game’s art style has to be mentioned. I am not the type of person to be big into artistic style, but there is no denying that the art style in Unruly Heroes is stunning. It kind of feels like you are playing inside a painting in Unruly Heroes. The backgrounds and characters are so crisp that it is hard to not just sit back and admire the artwork. Unruly Heroes is one of the best looking indie games that I have played in quite some time. So I began this review talking about how I loved playing splitscreen co-op games with my brother. This is one of the reasons that I was most excited to try out Unruly Heroes as there aren’t enough co-op games made these days. It turns out that Unruly Heroes supports up to four players so I ended up playing the game splitscreen with my brother. For the most part I think the game works well as a co-op game. Like all of these type of games, it is really fun bringing along another player for the journey. The co-op doesn’t really do much for the platforming mechanics but it is a nice addition for the beat ’em up sections. Having more characters fighting makes the battles more interesting. This is particularly helpful when it comes to the boss fights. If possible I would recommend playing Unruly Heroes with one or more other players. While I enjoyed the co-op mechanics and would recommend them, I think the game could have done more with them. I think the biggest issue with the co-op mechanics is that the game feels like it was designed as a single player game with the option of being a co-op game. Thus the game never really utilizes the co-op mechanics as much as they could have. Having another player along for the journey doesn’t drastically impact the gameplay. I don’t remember any puzzles where the players have to work together in order to solve them. The best co-op games try to utilize the fact that there are multiple people playing by forcing them to work together. The problems with the co-op is emphasized by the fact that the camera is not always equipped to handle two or more players. If the two players stay pretty close to each other, there isn’t a problem. When the players get separated though you start to encounter problems. These problems mostly pop up in the platforming sections. When one player gets more than one platform ahead of the other players, the camera ends up following one of the characters leaving the others off the screen. If a player is off the screen for a given amount of time, they are teleported to the player that the camera is following. This takes away some of the fun from the players that are teleported. At times it also seems kind of random which character is followed as the camera will sometimes follow a character that is behind the other characters. Another issue I had with Unruly Heroes is that the game has quite a few unfair deaths. I can’t remember how many times one of us died from having part of the environment fall on us unexpectedly. It is also sometimes hard to tell where a boss’ attack hits so you take damage that you don’t feel like you should have. Finally there are a few times where the controls aren’t as responsive as you would like. For example you may try to double jump and the game doesn’t respond. The good news is that these unfair deaths can be overcome pretty easily. Unruly Heroes has a checkpoint system that usually means you don’t have to repeat too much of a level when you die. The more forgiving mechanic is that you have four characters to use in each level. If one character dies, you can change to one of the other characters. A bubble will eventually float onto the screen after a short amount of time. If you can hit the bubble with an attack, you will regain access to the character you lost. The character will only have half of their health, but this allows you to recover from mistakes. The only time this can be a problem is during boss fights as you can lose one of your characters permanently (for the rest of the fight) if you don’t activate it in time. This adds an interesting dynamic to the boss fights as you are trying to fight/dodge the boss while getting to the bubble in time. At this point I haven’t completed the game so I can’t give you a definitive length. I have played the game for around six hours and I would say that I have finished a little more than half of the game. If the second half of the game is around the same length, I would estimate the game to take around 10-13 hours. That could change based on the difficulty of the second half of the game. From what I can tell, I would estimate that the game has around 30 levels. I was actually kind of surprised by the length of the levels as I would say that most of the levels are around 15-30 minutes long. For this type of game I would say that Unruly Heroes’ main campaign is pretty long. When you add in trying to collect all of the collectibles and that the game includes a battle arena (where you can fight against other players), I think you could get quite a bit of time out of Unruly Heroes. If you get a couple friends together to play the game, for $20 you could do a lot worse. At the end of the day I had quite a bit of fun playing Unruly Heroes. The gameplay is basically a combination of platforming and beat ’em ups with some light puzzle solving added in as well. Individually none of these mechanics are particularly original but the game does a good job polishing each mechanic to create a satisfying adventure. The co-op mechanics have a few issues but I would recommend bringing some friends along for the journey. Add in the gorgeous graphics and there is a lot to like about Unruly Heroes. The game does occasionally have some issues with unfair deaths and a few other small issues but it is still a satisfying experience. People who don’t really like the platforming or beat ’em up genres, probably won’t like Unruly Heroes. If you like both genres though and have some friends that could tag along, Unruly Heroes is a fun adventure that is worth taking. Some of the best visuals I have seen in an indie game in a long time. A fun combination of a platformer and beat 'em up that you can enjoy with your friends and family. Has some occasional cheap deaths and the controls could occasionally use some work. The co-op could have been implemented more into the gameplay and the camera has some issues handling more than one player.